The cold weather is here to stay, and it’s only a matter of time before we get our first big snowfall. When it comes to shovelling, Our Oakville Chiropractor begs you to use good form to avoid injuring your back. Here are some tips to keep your back safe while you clear the snow from your driveways and sidewalks this winter. Before the snow even starts falling, make sure you’ve got the proper tool to get the job done. 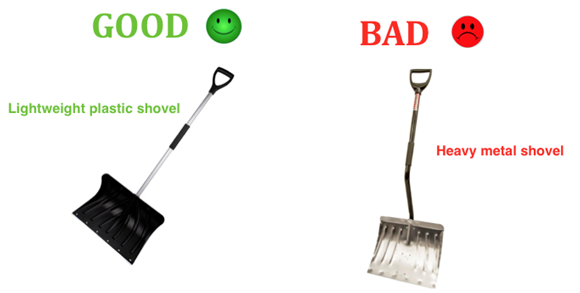 Using a lightweight shovel is best; this means that the plastic blades are better than the big heavy metal ones. A shovel with an adjustable handle length is ideal so that you aren’t bending too much, or having to lift with a long handle. There are shovels with two handles, one at the top and one part way down the length of the shovel – these are great to help distribute weight and make lifting easier! Getting off the couch and immediately walking outside to shovel is a recipe for disaster. Like any strenuous activity, your body should be warmed up prior to getting started. Walking, marching on the spot or even some light stretching will all prepare you for shovelling. Sure, marching on the spot might look uncool, but there is nothing uncool about protecting your spine. This is important for two reasons. Firstly, keeping your muscles toasty while you use them makes them happy. Rigorous exercise for cold muscles can cause strains and injury. Secondly, it will allow you to take your time and not rush. Shovelling in a rush can cause poor technique and trying to lift too much snow at once – both of which can leave you susceptible to injury. Bundle up and take your time! Your back will thank you. It’s also important that you wear proper footwear. Wear some boots with non-slip tread so that you don’t slip and fall while trying to get the shovelling done. We can’t stress the importance of proper technique enough. We’ve listed some tips that can keep you healthy through a winter of shovelling…. Face the same way you’re lifting and tossing snow. Move your feet! Avoid keeping your feet planted and twisting to toss the snow. Lift with your knees. Bend at the hips and knees to lift the snow. Do not hunch the lower back! Only lift tiny amounts of snow at one time. Don’t try to be superman/superwoman and lift a tonne of snow at once. When you have to relocate snow, walk there! Don’t reach or try to toss snow too far. When lifting, gently contract your core. This will keep your lower back well supported when you’re lifting the snow. Take breaks! If you’re huffing and puffing after half the drive way, chances are your lower back is tired too! Don’t be ashamed to take a break part way through. Nobody will know. Feeling tired and achy after you finished the job? Rest! Try some gentle stretches for the lower back, have an Epsom salt bath or grab a heating pad to soothe the tight muscles. Are you reading this blog too late and you’ve already hurt your lower back trying to shovel? Come see Dr.Steve or Dr. Jenn to help relieve your pain!